the chicken was coated in a delicious crust of corn flakes and honey, which made the chicken incredibly crispy and gave it a unique hint of sweetness. At the same time, the meat inside was wonderfully tender. The mashed potatoes and gravy and the corn on the cob were simple, but delicious; the perfect accompaniments to let the fried chicken shine. I’ve known about The Downtown Diner for a few months now. I first read about it on the Baconhound’s blog, where he rated it as one of the top 5 burgers in Edmonton (well, Edmonton and surrounding area). Since then I have been wanting to pay The Downtown Diner a visit, but I just never got around to it. And then a few weeks ago John Catucci was in town to film at The Downtown Diner for an episode of You Gotta Eat Here! knew that I better get my visit in before the episode aired, or I’d have to fight the crowds later. Fort Saskatchewan is north-east of Edmonton and a little bit of a drive from where I live. So, I knew I had to find just the right friends who would be willing to go on a food adventure to Fort Saskatchewan with me. I messaged my friends Adam and Anika, both foodies and readers of my blog because I thought they would probably be game and, no surprise, they were! So, a couple of Saturdays ago we piled into Adam’s car and headed out to Fort Saskatchewan. We got to the Diner at about 6:30 and although it was steady, we only had to wait for about 10 minutes. Once we were seated, we quickly browsed through the menu to figure out what we were going to order. 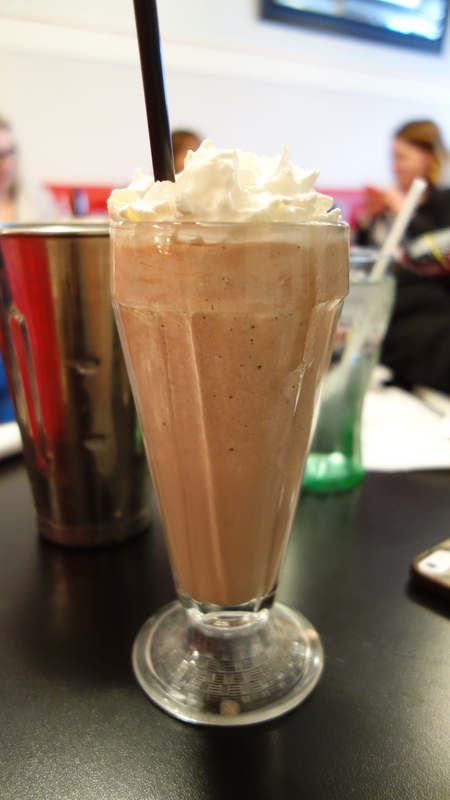 Because we were at a diner I knew I had to order a Chocolate Shake. I mean, how could I not? When I placed my order, our server told me that the shake would take a little while because they were making it from scratch, and that in fact all of the food would take a while to prepare. To be honest, I wouldn’t say the food took THAT long, but I appreciated the heads up and if the food is going to be high quality, then I generally don’t mind waiting a little longer. The chocolate shake was very tasty, you could tell it was made with quality ingredients. My only qualm is that it could have been just a little more chocolatey for my taste, but that’s just me, I prefer a very rich, dark chocolate. 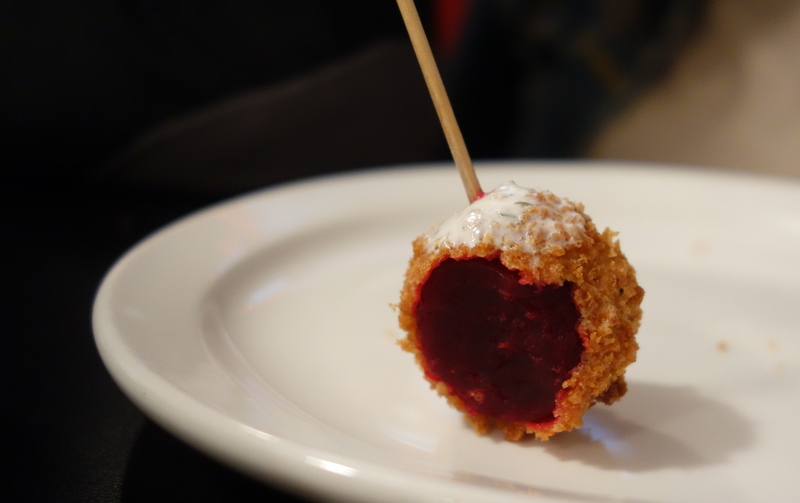 We started with an order of Deep Fried Sweet Beets which were served with dill dip. 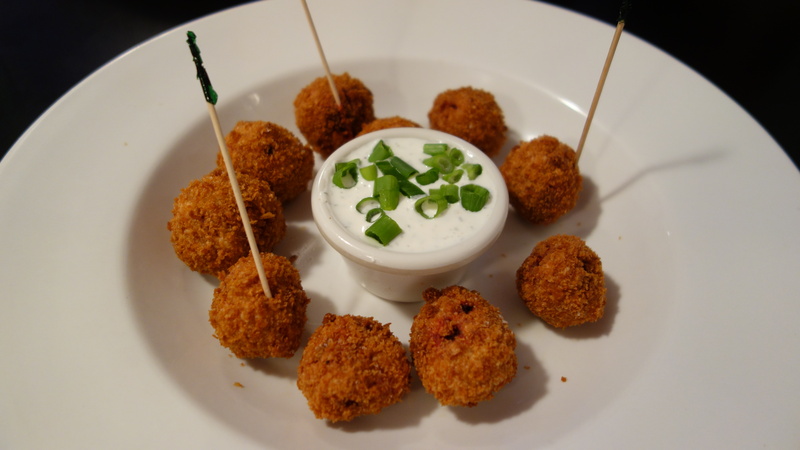 This was a twist on the diner classic deep-fried pickle. I’m not a huge beet fan, but I gave these a try, because I figured if I didn’t like beets deep-fried then I probably never would. Adam and Anika both seemed to enjoy the beets, but I’m not sure if I am quite sold on them yet. I did think they were very pretty though; gorgeous beet red colour. For dinner, I decided on classic Fried Chicken, which was served with mashed potatoes and gravy and some corn on the cob. 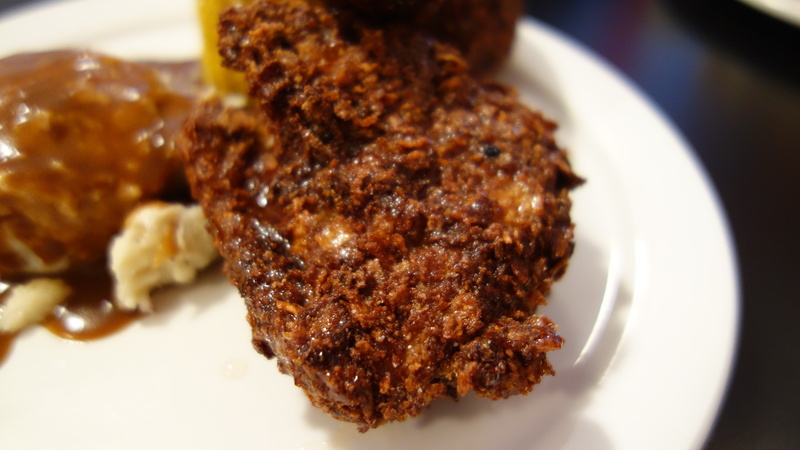 The chicken was coated in a delicious crust of corn flakes and honey, which made the chicken incredibly crispy and gave it a unique hint of sweetness. At the same time, the meat inside was wonderfully tender. The mashed potatoes and gravy and the corn on the cob were simple, but delicious; the perfect accompaniments to let the fried chicken shine. Anika decided on another diner classic, the Monte Cristo. This sandwich was made with roast turkey, smoked ham, swiss cheese and then dipped in an egg batter and baked in puff pastry. I don’t think a sandwich gets more decadent than that. Anika commented that she really liked that the meat in the sandwich was real slices of meat, rather than deli meat (which, again, is another sign of quality ingredients). 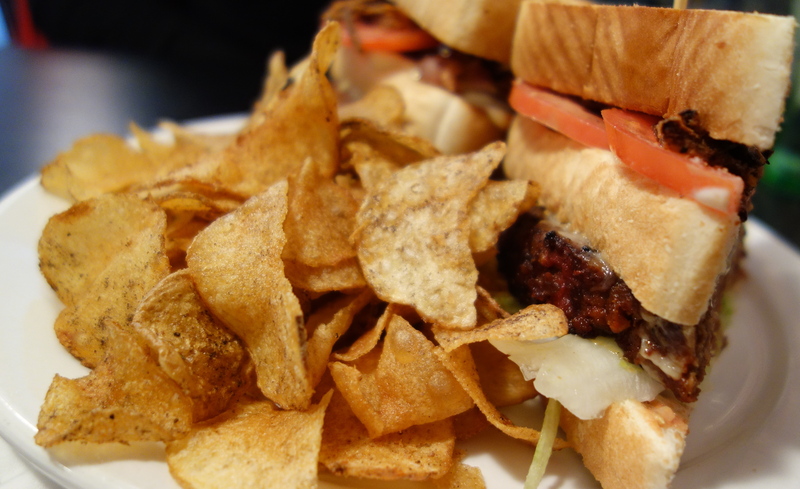 Adam ordered the Meat Loaf Club, which is a twist on the classic club sandwich. 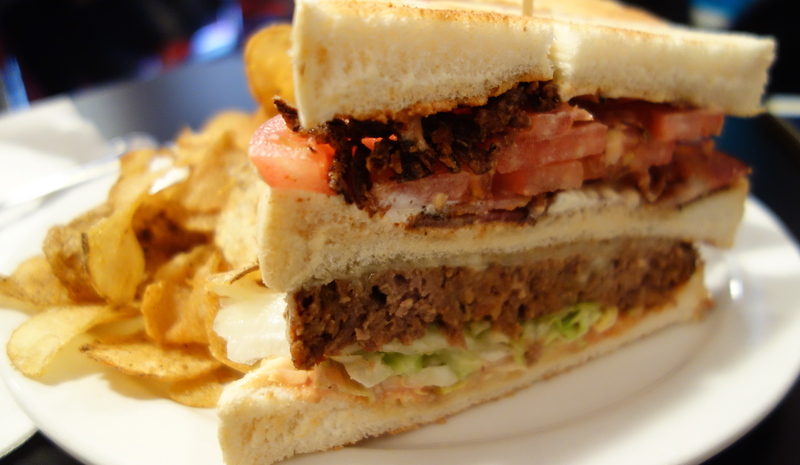 The sandwich was made with layers of seared meatloaf, aged cheddar, smoked bacon, lettuce, tomato, crispy onions and a ketchup-mayo blend, all served between 3 layers of Texas toast. I though Anika’s sandwich was decadent, but this one was over the top. Adam said it was the best clubhouse of his life. 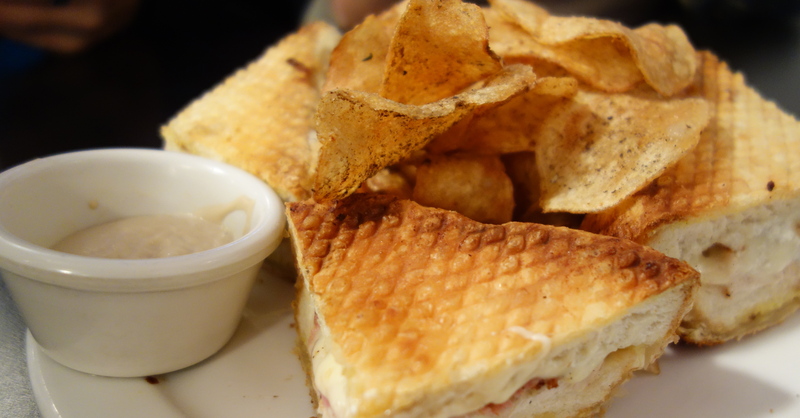 Both sandwiches were served with the Diner Chips, which were essentially house made potato chips. They were perfectly crispy, well seasoned and served with a delicious homemade dip. Overall we really enjoyed our meal at The Downtown Diner. It was a lot of fun to get out of the city and visit somewhere really special outside of Edmonton. Our one comment was that we were surprised the diner was only open until 8 on a Saturday, that seemed so early to us! It wouldn’t surprise me though, if The Downtown Diner is lined up out the door at 8 once it’s episode airs on tv. It really is that good. And it really is worth the trip. I’m dying to try the Downtown Diner. Now to convince Dad that the drive is worth it…. Next Entry Elephant and Castle Gift Card Giveaway!